Fighter jets train in a canyon that earned its nickname because its mineral-rich soil and rocky walls draw to mind a landscape in a galaxy far, far away — Tatooine, the home planet of “Star Wars” character Luke Skywalker. DEATH VALLEY NATIONAL PARK, Calif. — Silence and stillness settled over the deep, sunbaked gorge as a pair of photographers sat on a cliff, waiting. Then the rumbling started. As it grew louder, they scrambled into position. Within seconds, a thunderous roar reverberated from the steep, narrow canyon as an F-18 fighter jet streaked through it, passing beneath their feet. It came so close they could see the pilots’ expressions. 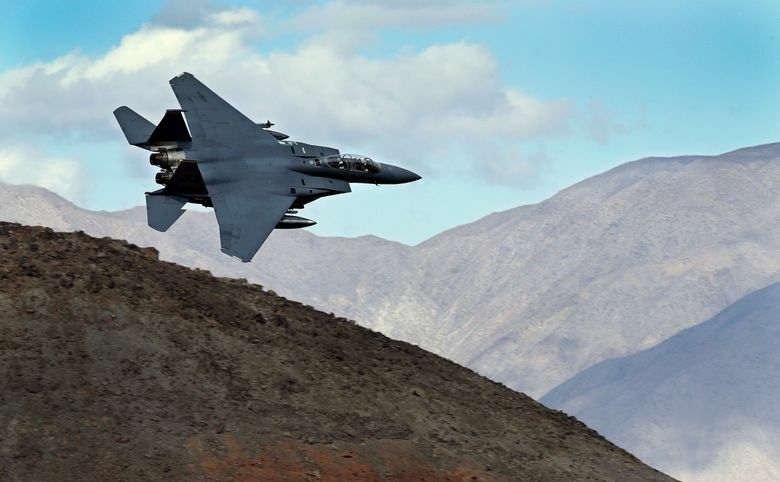 This deafening show that was over in a flash is a fairly common sight at Death Valley National Park, 260 miles (415 kilometers) east of Los Angeles, where U.S. and foreign militaries train pilots and test jets in the gorge nicknamed Star Wars Canyon. Photographers — some capturing images for work, others for fun — along with aviation enthusiasts and others have been traipsing to the remote 4,688-square-mile (12,142-square-kilometer) park in growing numbers to see the jets soaring below the rim of what’s officially called Rainbow Canyon, near the park’s western entrance. It earned its nickname because its mineral-rich soil and rocky walls in shades of red, gray and pink draw to mind a landscape in a galaxy far, far away — Tatooine, the home planet of “Star Wars” character Luke Skywalker. The unusually close-up view of military planes zooming through the craggy gorge has become so popular the National Park Service is considering making it an attraction, with informational signs about the training that dates back to World War II. Park Service officials recently discussed erecting signs and possibly paving a spot for cars because so many people are driving to the canyon to see the training, park spokeswoman Abby Wines said. Wines understands the rush people get from seeing the jets up close. Once she was doing technical canyoneering, hanging from a rope on a 180-foot vertical, when a jet roared over her head but below the canyon rim. “It’s the loudest thing I have ever heard in my life,” she said. “It was a scary experience since I was holding onto the rope and not anything else.” She also felt a sense of awe. But on days when one jet passes after another, the noise gets to her. Elsewhere in the park, the jets also have made it tough when performing the living history show at Scotty’s Castle, a Spanish mission-style villa reflecting early California architecture. The villa recently closed until further notice because of flood damage. But when it was open, it was “disruptive to act like it is 1939 while two military jets are circling, pretending to be in a dogfight above your head,” Wines said. On a February day, planes careened through Star Wars Canyon 18 times. One pilot performed barrel rolls over the pass. Jets zip through the gorge at 200 to 300 mph (322 to 483 kph) and can fly as low as 200 feet from the canyon floor. But the canyon’s walls are so steep, the aircraft are still several hundred feet below the rim. Training at the canyon doesn’t happen every day, so the photographers who make the trek to see them sometimes sit in folding chairs, waiting in the heat, and spy no jets at all. Jason Watson, who works in information technology at Stanford University’s law school and does freelance photography, recently made his seventh trip to the gorge. He’s seen as many as 30 photographers spread out across the mile-long rim at different vantage points. “You can meet anyone from anywhere in the world there,” Watson said. The photographers develop a camaraderie as they share in the thrill of standing above the speedy jets. The aviators interact with them too, giving a thumbs-up or even flashing a “Hi Mom” sign as they whiz by.